The Snap on Smile offers a simple life changing solution for many patients of all ages enhancing everything from crooked and missing teeth to an alternative for those not eligible for implants. It is perfect for those who want to avoid shots and drilling as well as those who simply want better functioning teeth quickly and affordably. The Snap on appliance is made of very thin, but extremely strong, specialized resin that resists staining. It can be used for years or worn as a preview and covering over ongoing dental restorations. The Snap on appliance simply snaps in and out over a patient's natural teeth. The process is quick and painless. 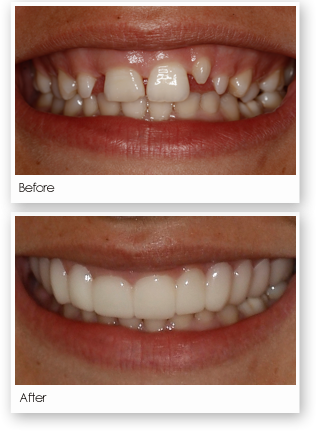 Photos and impressions of your teeth are taken, then a smile design and color are chosen and in about 2 weeks the final product is delivered and "Snapped" into your mouth. Snap it in and wear it home.